Hi friends – Happy Friday! Sorry to have disappeared on you. It’s actually been for a good reason though. I’ve been working hard to get Cullen on a pretty regular eating/napping/sleeping schedule, and we have had three really good days and nights in a row. Trust me, this is exciting stuff. Since it’s Friday and everyone is just counting down to start the weekend, how about a little video fun? I’ve been getting a lot of emails and comments recently about babywearing. When Cullen was an itty bitty newborn, he really liked to be worn most of the time. He snuggled up to my chest and napped all day while I went about my business. 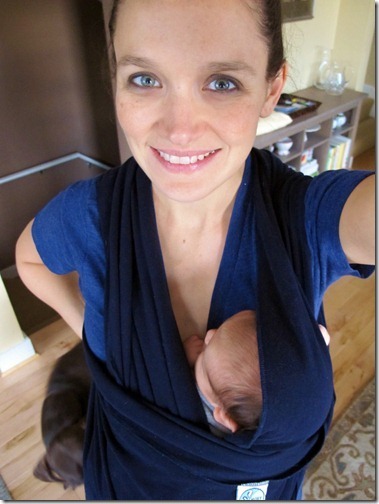 I told you all about how I used both the Moby wrap and the Ergo for those first few weeks and months. Of course, as does everything baby-related, my babywearing has changed quite a bit now that he has doubled his birth weight. I only ever use the Moby wrap these days if he is going to be facing out – like he was when we were baking together last weekend. 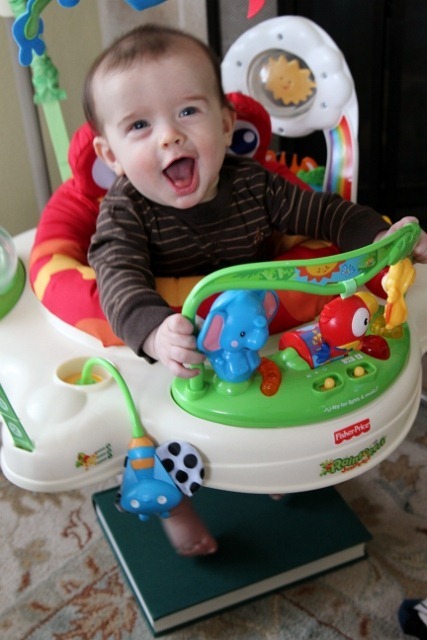 Or bouncing around in his new jumperoo – learning how to use his leg muscles and finding some balance. And if I’m being totally honest, as much as I love holding him and snuggling him on my chest, he’s too big now for me to do that and actually get anything done. So we save our snuggles for walks for just quiet time in the rocking chair, and the rest of the time I put him down to learn how to explore the world himself. But when we do go out for walks, we are still getting great use out of our Ergo carrier. I have had a lot of moms tell me they find the Ergo to be too bulky and hard to put on/take off when they are alone. I also get a lot of questions about my blanket roll technique for replacing the infant insert. Since I was on a roll, I made another video showing how I do the blanket roll, and how I get Cullen in the Ergo when I’m by myself. I made these videos right before bedtime, so please excuse his volume. :) I still love carrying Cullen when we are out and about, but as he continues to get heavier, we’ll probably transition to the stroller more and more. There is only so much my back can take! Once he has a bit more core support, I hope to do some of the fun hip holds and side wrap techniques when we’re out grocery shopping or checking out the farmer’s markets (activities that aren’t very stroller friendly). And eventually, he’ll make it onto my back! That’s the update on babywearing, and all the video entertainment I can provide for the day. Hope everyone has a great weekend! 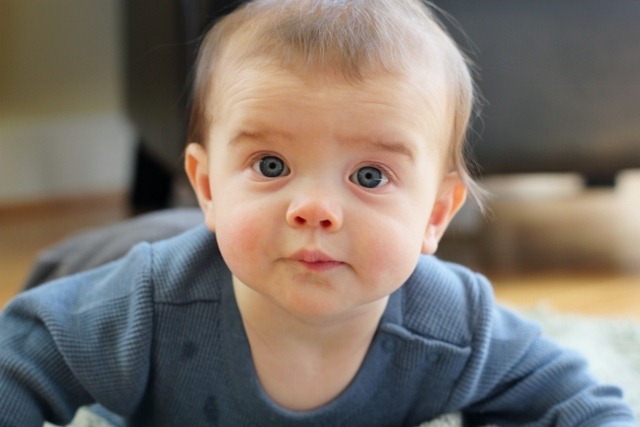 Did You Regret Your Baby’s Name? « Previous PostWhole Wheat Oatmeal Banana Bread. Next Post » Lemon Mushroom Pappardelle with Kale Pesto. GREAT videos!! So helpful and fun to see you guys! love reading these posts!! and plan to come back over and over again to read them again once i have kids ;) thank you for this! Thank you for the ergo video Emily!!! The infant insert is great for walks around the neighborhood (it keeps her cozy in our cold Colorado weather), but is really awkward when you’re out and about and don’t have a place to put the baby to get her into the insert. We’ll definitely try using a blanket! Cullen is so stinking cute! Just discovered your blog, very excited to read more!!! Aww, so cute! Gosh, I can’t beleive how much he’s grown. 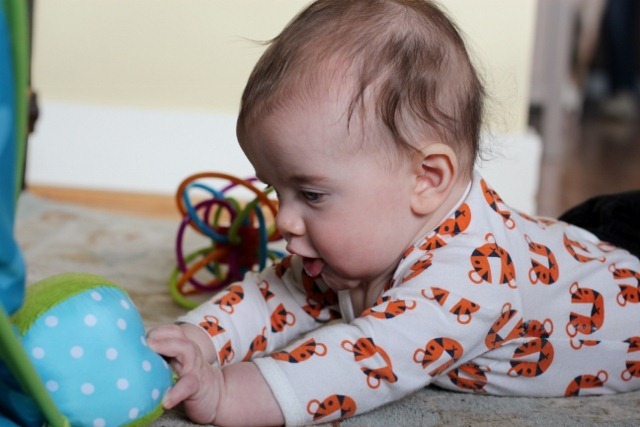 There are so many of your baby posts that I find myself bookmarking for later! I know this one will be particularly helpful. There are so many baby-wearing options out there now that it is already overwhelming to me! Oh Emily… that was so lovely and helpful. I am 5 months pregnant and have found so much valuable info on your blog. Thanks for sharing and taking the time to make videos. Cullen is adorable, and you look fantastic! Namaste. What did you do to get him on a schedule? I’m struggling with this with my 5 month old. I had both as well and really loved my ergo until recently. My son, 20 lbs, was strapped on my back for a walk and all of a sudden one of the straps on the side ripped, so crazy. I luckily did not drop him. The strap had ripped and it wasn’t even at the seam. I did call them and was very disappointed with their response. They also refused to send me another. So just letting people know since we are carrying around our precious treasures. This update is so helpful! 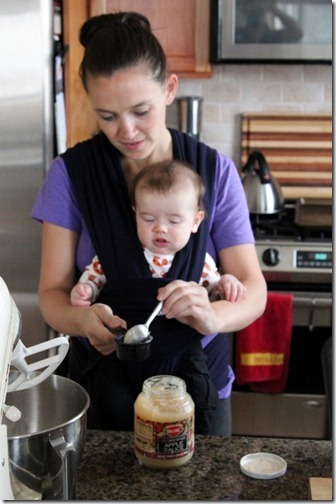 I have a huge interest in babywearing and there’s several products out there. It’s great to see how much use you can get out of each and up to what age. I’m still early in my pregnancy, but it’s good to be informed.